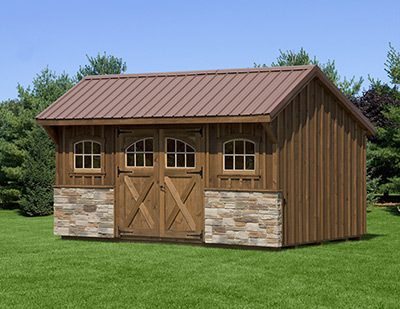 If you've ever dreamed of owning your own shed but have always felt it's outside your price range, our Rent-to-Own program may be the perfect option for you. The Rent-to-Own program allows you to make monthly payments for either a 24-month or 36-month period, until your shed is paid in full. No credit check is required. Simply place your order with one of our sales staff, and after an initial down payment of your first month's rent, you'll have your shed and will begin making your monthly payments. Save money. Instead of making payments on a mini storage unit, you'll be making payments on your own shed that you'll eventually own. No credit check. If your credit isn't exactly where you'd like it to be, no problem. We don't require credit checks to qualify for Rent-to-Own. Pay off early. If you have the money and want to pay off early, you can do so. No need to wait until the end of your term. No penalty for ending agreement. If you are unable to complete your term, simply let us know, and we'll pick up your shed. No further payments will be needed, and there'll be no penalty for ending early. Call us today or click here to see if you qualify.